Thanksgiving may get all the attention in November, but Small Business Saturday (November 25th) and Giving Tuesday (November 28th) are where it’s at! These two mini-holidays celebrate two of the things that we here at Artist Shops find super important: small, independent businesses (like artists!) and people who add positive vibes to the world by using their profits and designs to donate to good causes. So this year in honor of these two great days, we’re featuring some awesome Artist Shops and yours could be one of them! Get featured on both the Threadless.com blog and the Creative Resources blog. Be included in an email to the Threadless and Artist Shops community. Get highlighted in a special collection on the Discover page on Threadless.com. Be posted on Threadless’s social media! I’m in. How can my shop get picked? 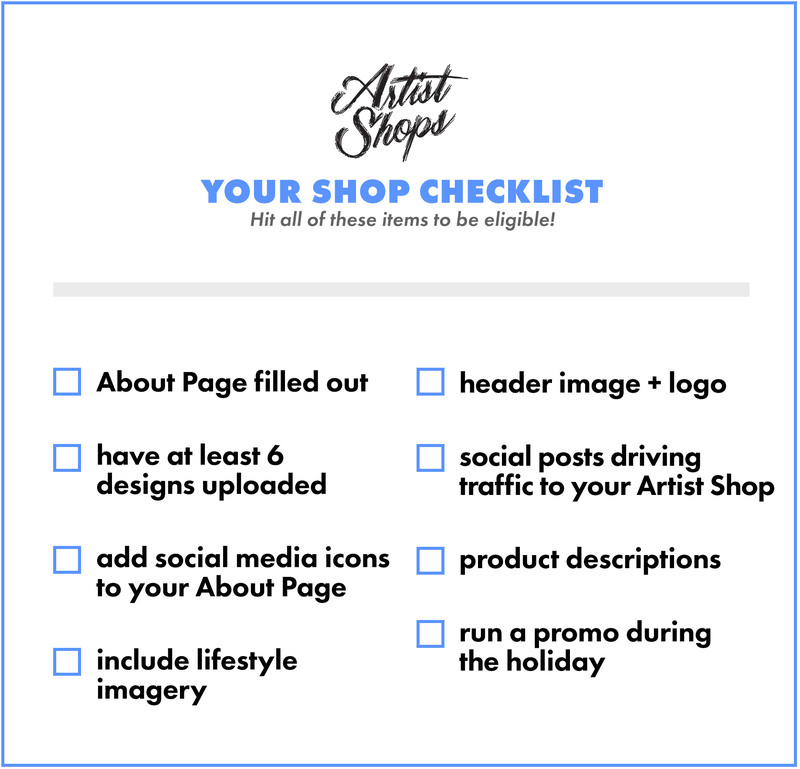 About Page filled out: make sure you’ve 1: added an About Page to your shop and 2: have it thoroughly filled out to let us and your customers know a little more about you and your creations! Have at least 6 designs uploaded: to be considered, you must have at least six designs for sale in your shop. Add social media icons to your About Page: did you know you can add social media icons to your About Page to link people to your Twitter, Instagram, website, and more? You can add them when you’re filling out your About Page right in your Dashboard. Include lifestyle imagery: feature at least two lifestyle photos of your products in your homepage collection. Header image + logo: your shop must have a header image as well as a logo included. Don’t miss out on getting your shop featured and gaining traffic for it just in time for holiday shopping season! Prep and submit your shop before November 17th for your chance to be featured! Is your shop ready to go? Submit it here!